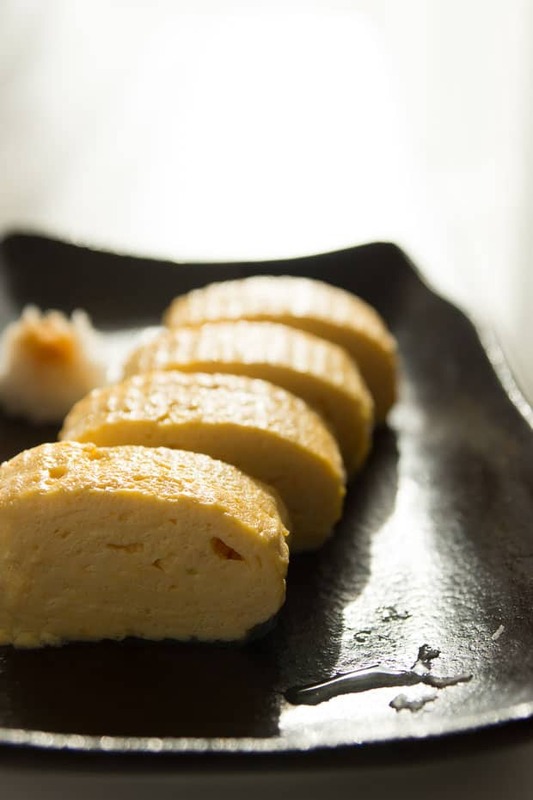 Dashimaki Tamago (だし巻き卵) is a traditional Japanese rolled omelet made with egg and dashi. Here's my technique and tips for making it in a regular round pan. In Japan, it’s often said that you can judge the quality of a restaurant by the quality of their dashimaki tamago (だし巻き卵). It’s a rolled omelette that makes for a great benchmark because it’s not only ubiquitous, it takes an enormous amount of skill and experience to produce a good roll. While there are many seasoned and rolled egg dishes in Japan, dashimaki tamago, which literally translates to “dashi rolled egg” has a smile inducing elegance that belies its simple looks. As the name implies, dashimaki tamago contains almost as much dashi as there is egg, creating a magical suspension of liquid within the egg making each bite melt away into a pool of flavorful soup. White soy sauce not only seasons the egg, it makes the umami in the dashi bloom without discoloring your egg. While the ingredients may sound simple enough, it’s the acrobatics required to roll something so delicate that makes this a challenge, and meeting the exacting standards of an old-school Japanese chef can become a maddeningly difficult cycle of failure. 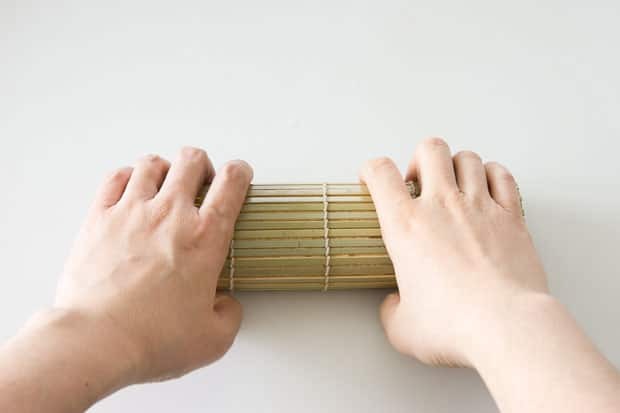 When I staged at a Kyoto restaurant a number of years ago, I was taught to roll the egg using chopsticks in one hand and a circular Ferris wheel motion with the pan in the other. Like trying to eat pudding with chopsticks it’s a task that seems impossible at first. As I destroyed roll after roll, I remember thinking to myself “Spatulas were invented for a reason!”. But a look over my shoulder at the stern look on my master’s face, along with the well worn “encouragement stick”, hanging on the wall, and I chose wisely not to question his methods. While I did eventually manage to roll one using chopsticks, at home, I use a spatula. 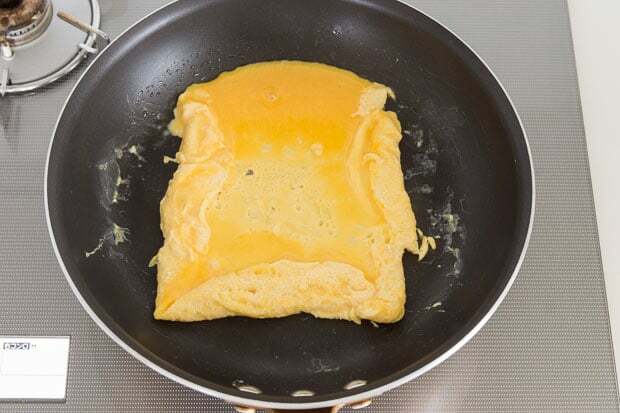 Ideally, you’ll have a rectangular tamagoyaki pan to do this because the delicate egg is hard enough to roll without having to worry about shaping it too. That said, I know it’s unlikely that most of you will have one of these, so I’m going to show you how to do it in a round pan. Don’t be too disappointed if your dashimaki tamago doesn’t come out looking perfect the first time, or even the first dozen times you make it. Regardless of what shape it ends up being, it should still taste delicious. Break the eggs into a large bowl. You want to mix the whites and yolks evenly but you do not want to incorporate air. To do this, hold the chopsticks (or fork) at a 90-degree angle to the bottom of the bowl and use a left and right cutting motion to beat the eggs. Don't use a circular or whipping motion, as this will incorporate air. In another bowl, stir the dashi, white soy sauce and potato starch together until the starch is fully dissolved. Pour the dashi mixture into the eggs and stir together thoroughly while trying to limit the amount of bubbles that form. 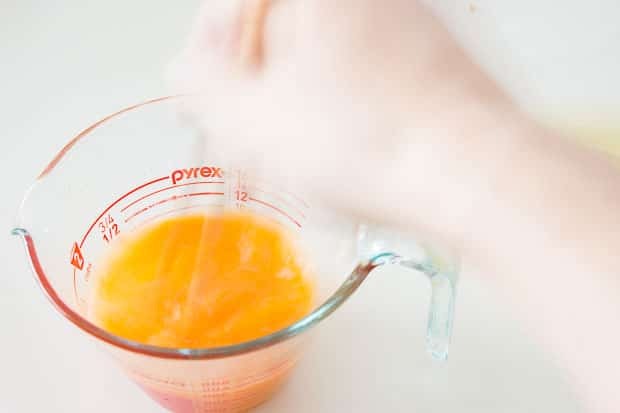 Strain the mixture to remove any clumps of unmixed egg. This should also remove any bubbles that may have formed when you mixed the dashi with the egg. Heat a 12-inch non-stick frying pan over medium heat until a drop of water added sizzles but not so hot that it beads and hovers around. 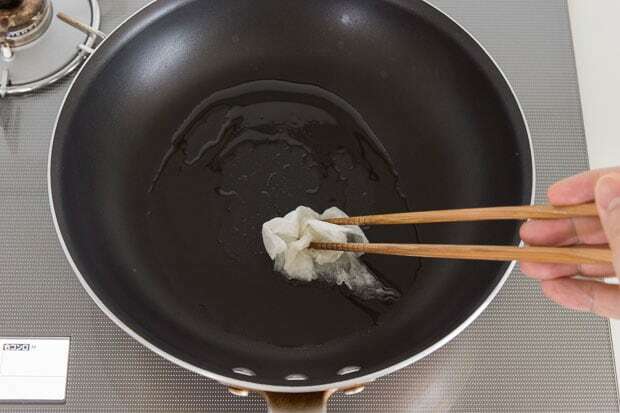 Pour the oil into the pan and use a small wad of paper towel to spread the oil to evenly coat the pan and to soak up the excess. Pour 1/4 of the egg mixture in and let it cook. As bubbles start coming up, use chopsticks to pop them. As the bottom layer of egg sets you'll notice it becomes more opaque. 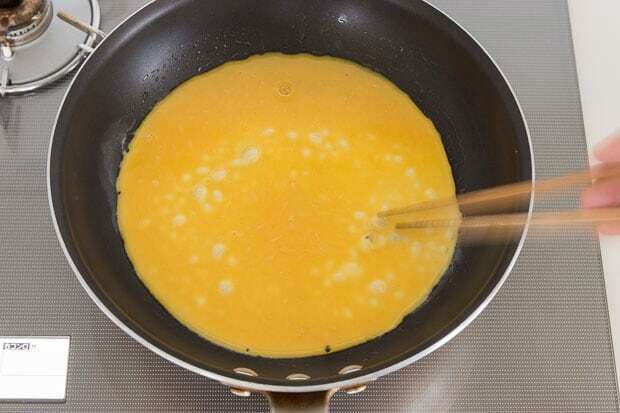 When the egg is half way cooked (but there's still some liquid egg on top), use a spatula to gently flip the left quarter towards the center of the pan and then repeat with the right quarter. Use the oil soaked paper towel to grease the empty part of the pan and pour another 1/4 of the egg mixture into the pan. Gently lift the roll from the edge facing away from you and let the egg mixture run under the roll. Repeat from steps 5-8 until you've used all the egg. When the dashimaki tamago is done turn it out onto a sushi mat and gentle roll the mat around the egg, tucking the edge under the bottom of the roll, and let it rest for 3 minutes. For the daikon, peel and grate the daikon using the hard cheese side of a box grater. 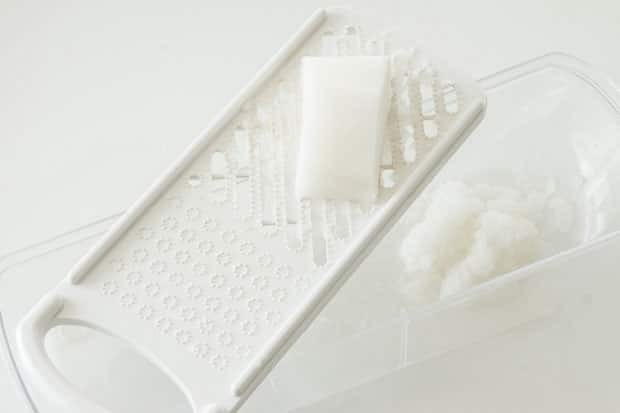 Squeeze out the excess water. To serve, slice the dashimaki tamago and garnish with a mound of grated daikon topped with a splash of soy sauce. I want to try this as soon as I can since I have a square pan and the gif you made was very informative. Your tamago cooking method and, of course, the recipe reminds my days when I was on technical training in Choshi Shi, Chibaken. Back home in Philippines, I’ll do the morning with your tamago roll method instead of just plain omelet. Thanks for sharing. How does tamago with mountain yam made? I really want to try this. have you ever had it or made it? Hi Shawn, you can add some mountain yam (yamaimo) to dashiki tamago to make it more fluffy. You don’t need much. For this amount of eggs, 1/4 cup or less should do. Marc, what do you use to make the dashi stock? Marc, what do you use for the dashi stock?